Help & DocumentationCreating ContentCreating Basic Metrics and Reports Choosing between Metrics, Multi-Metrics, and ReportsShould I use a Metric, Multi-Metric, or Report to visualize my data? Should I use a Metric, Multi-Metric, or Report to visualize my data? 1. When should I create a Metric? Zoom: When should I create a Metric? 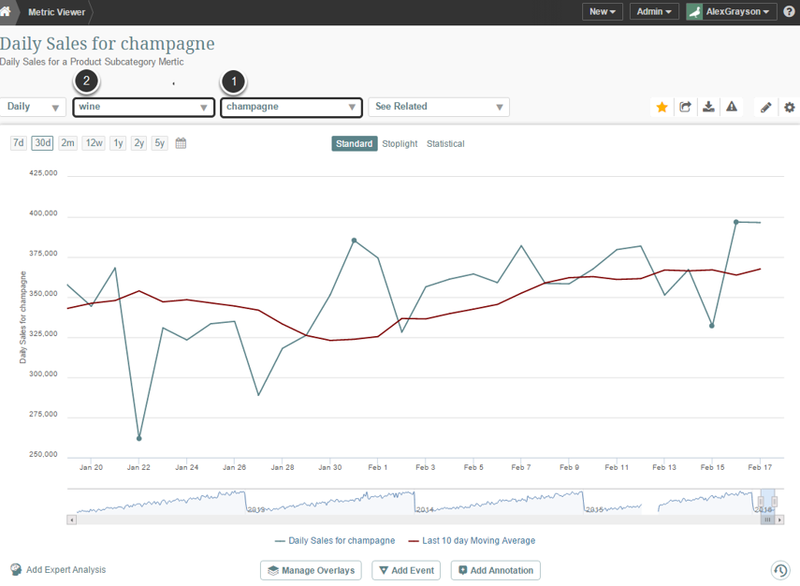 A metric is the right element type to use when you want to chart a key measure across time. A metric may include a dimension and is limited to a single measure and must show trends over-time. The above example illustrates a metric that charts the Sales measure using a dimension drop-down for Product Subcategory (1). A parent Category (2) value is also included as a drop-down in the chart. 2. When should I create a Multi-Metric? Zoom: When should I create a Multi-Metric? A Multi-Metric is used when you want to combine more than one Metric together in the same chart. 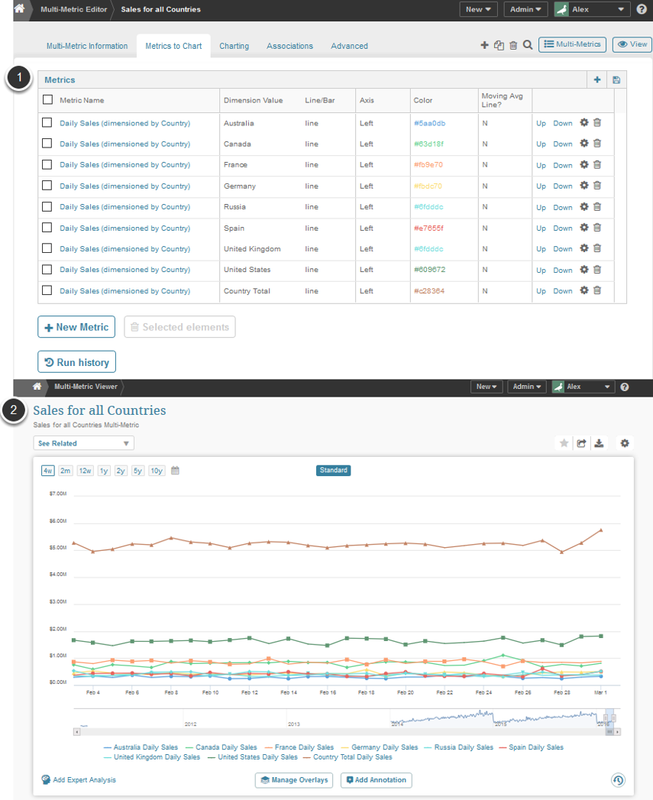 The above example illustrates a Multi-Metric that charts a Sales metric together with a Daily Visitors Metric. See below for example of second advantage. 2.1. Example of how all dimensions of a single metric can be displayed on one chart using a Multi-Metric. Zoom: Example of how all dimensions of a single metric can be displayed on one chart using a Multi-Metric. 3. When should I create a Report? 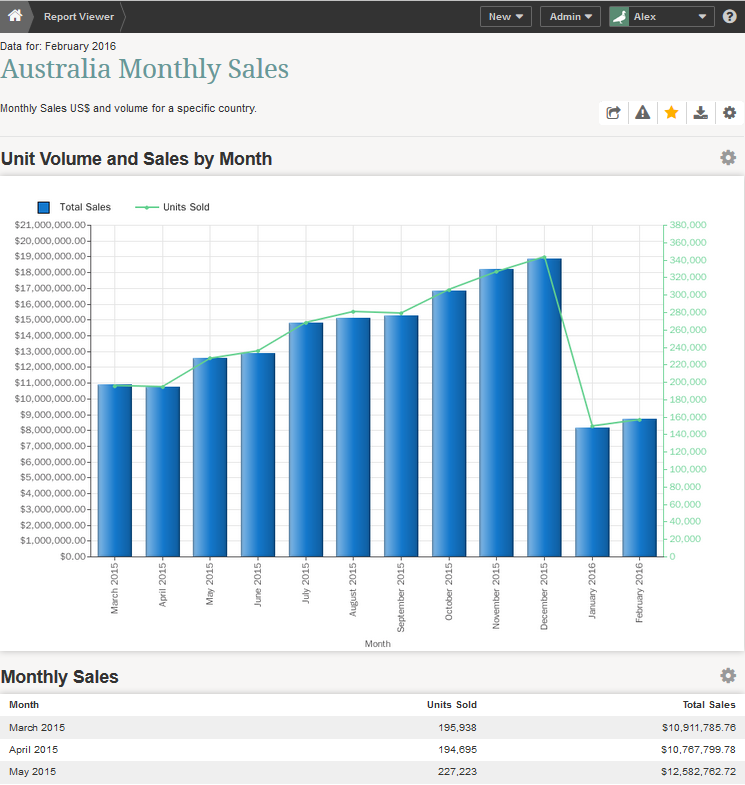 The above example shows an example where data was pivoted and charted as a stacked bar chart. Prev: What capabilities are supported by different types of Elements? Next: What options are available for manually loading metric and report data?